Like it or not, we are in the waning days of summertime. And it's still hot. I'm as big a proponent for cooking from scratch as the next food writer. But while making granola isn't rocket science, it involves dealing with a hot oven for over an hour. One might think this is a project that's better suited to winter, but who wants granola in the winter? That's the season for a steaming hot bowl of soul-warming oatmeal. Really, if you are going to try and make your own granola, you have a limited window in the early spring when it's cool enough to cook with your windows open, but warm enough to crave a lighter breakfast. Right now you are better off leaving that task to someone else while you enjoy a cool, refreshing drink on the veranda. And those someones are Caroline and Paul Barrett, the husband and wife team behind Our Daily Eats. They didn't start off as a granola company. They started off as a nut company with Caroline's spicy maple almonds. But this actually turned out to make them better granola bakers. 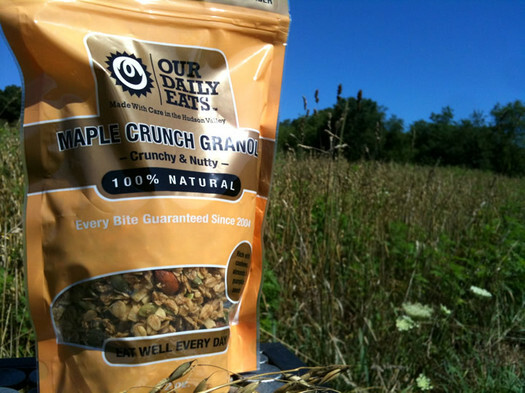 What stands out right away when eating their maple crunch granola is the sweet and salty balance. It's not overly sweet and unlike some other maple sweetened products the maple flavor actually comes through. They are able to achieve this by using a lot of real maple syrup, which is the first ingredient after whole grain rolled oats. There is also a touch of brown sugar in there as well. Sweetness, however, is only one side of the coin. 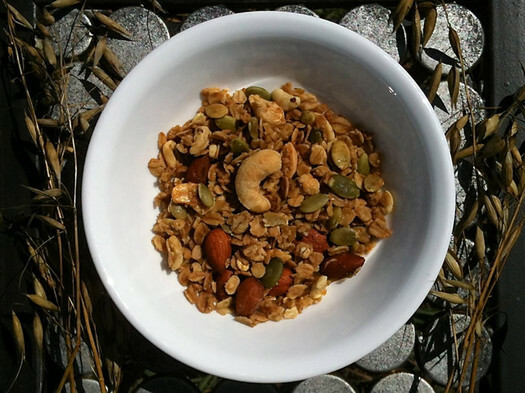 Compared to other granola, their 90 mg of sodium per one ounce serving is aggressive. That's not to say this is too salty. It's great, and the sea salt works well with both the sweet caramelized notes from maple syrup and brown sugar, and the nuts. Did I not mention the nuts? This is the granola that eats like a meal. And if you are going to be paying a premium for granola, you want it to deliver. It's filled with pumpkin seeds, cashews, and almonds, which makes it in many ways seem as much like a fruitless trail mix as it does a breakfast cereal. The only other ingredient in the bag that I've yet to mention is olive oil. There is nothing weird or sneaky in this cereal, just wholesome kitchen cupboard ingredients. Nothing genetically modified. Nothing that is on the hot-list of high pesticide load foods. And right now, I can't think of a better breakfast than a little bit of this granola on top of some yogurt. If that makes me a hippie, well, I've been called worse. Our Daily Eats sells its granola (and other products) at a handful of local farmers markets, including Delmar and the Schenectady Greenmarket (every other week). They're also carried by Price Chopper, Honest Weight, and many other stores around the state. Our Daily Eats has advertised on AOA in the past. Thanks for the perspective and kind words on our granola. We are glad you enjoyed it. LOVE Our Daily Eats. Hands down, the best granola and other goodies available. (Have you tried the Mexican Mocha Almonds?! Yum). As @AbbyThyme says, I am Crunchy Granola Girl that stays crispy in soy milk. And I didn't know that Our Daily Eats was a local company. Thanks for the scoop of good taste made with all ingredients I can recognize.